If you don’t want to be stranded in a foreign country, you must use a travel planning app. Confused? Let’s have a look at the example of a traveler named John. John has booked an international tour package online. To board the flight, John reaches the airport. He’s asked to present the tickets at the ticket counter. The airline had sent the copy of tickets to John’s inbox. John enables mobile data connection. Then, he opens the email client application to show the ticket confirmation email. John is given a clean chit to board the flight. John reaches the destination, a foreign country where English is not the official language. He knows that the taxi drivers in a foreign country may take a longer route intentionally to make more money. Before booking a taxi, he opens the navigation app to find the shortest directions to the hotel. Although John is smart, he assumed that his mobile service provider supports international roaming. Unfortunately, the mobile operator doesn’t recognize John’s Sim card. John is now stranded. Discovering new places: The biggest advantage of using a trip planning application is that you can read the review of places you’re planning to visit. You can also get directions to the destination with the app. Discounts: Restaurants and hotels companies hike their tariffs during the holiday season. If you book hotels one or two months checking in, you’ll enjoy a good discount. Also, booking a flight in advance can save you 100s of dollars. All tickets in one place: The apps can analyze your emails and display the tickets you’ve booked recently in a single window. Offline: Some travel planning apps can save your tickets and directions on the phone. Hence, you can use them in offline mode. 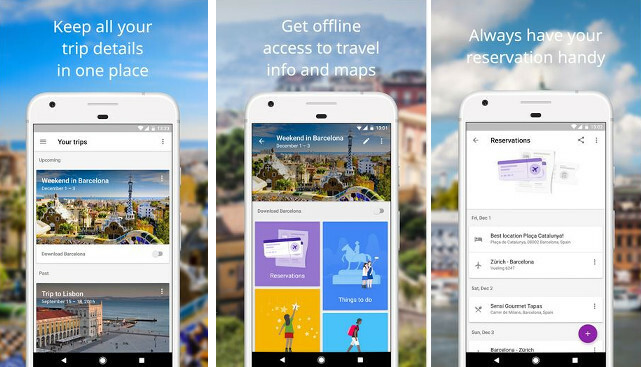 Google Trips is powered by Google Maps and Places. It is one of the top travel planning apps on the Play Store. The GT app scans your Gmail inbox and displays the tickets you have booked recently. It also displays the locations you’ve saved on Google Maps. The Trips app from Google can save the maps and directions on your phone. It allows you to find the best deals on flights, hotels, restaurants, etc. Google Trips scans your location and displays a list of coolest places near your current location. It allows you to share your reservation details with other users. You can bookmark places in Google Trips. You can also create a list of places with this application. To use Google Trips, you must sign in to the app with your Google account. 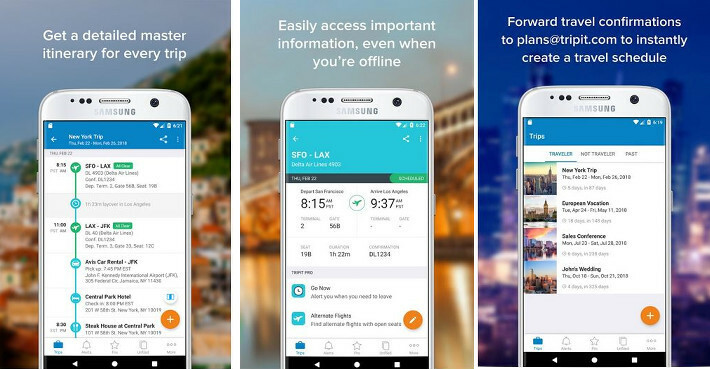 Tripit is a powerful travel planner app. Its interface is divided into three sections Traveller, Not Travelled, Past. The Traveller section displays a list of upcoming trips. The 2nd section boasts trips you’re planning for the future. When you’ve completed a trip, Tripit won’t delete it from its database. In the Past section of the app, you’ll find the completed trips. To use the Tripit app, the user must forward the flight, train, booking ticket to a special email address. Users can also link their email account with Tripit. Once the user forwards the email or links his/her account, Tripit will analyze the email. Then, it will create a powerful itinerary. Tripit allows you to add a new plan to an existing trip. It also lets users merge trips. The app allows you to discover the popular tourist locations in the place where your train, bus, or flight will stop. Tripit lets you share the itinerary with other users. Users can sign in to the Tripit application with their Google, Facebook and Yahoo account. Tripit is a cross-platform service. You can access your trips and plans on devices that support internet connectivity. Flight status alerts, check-in reminders. Seat tracker, refund monitoring, trip sharing, etc. TripAdvisor is the most popular travel planner app. It has 10+ million users. TripAdvisor scans 190+ hotel websites and displays a list of websites that have the lowest fares. The app allows you to read the reviews of business places. It lets you find the best places to visit nearby you. TripAdvisor features a forum section where you can discuss your favorite topics. The app maintains a list of businesses or tourist locations you’ve recently viewed. It also allows you to bookmark locations. 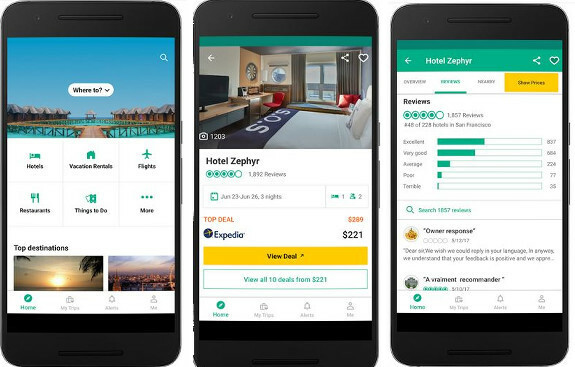 TripAdvisor app provides an option to add new trips. While creating a trip, you can add places, restaurants you might visit. TripCase is a cross-platform trip organizer app with a user base of 1 million. To add trips in the TripCase app, users must send the confirmation emails to trips@tripcase.com. The TripCase app features a contact section. To invite people to the trip, enter their first name, last name, and email address. TripCase will send alert emails to the inbox of contacts you’ve added. The app can automatically merge trips that are scheduled on the same day. It supports 9 languages. Sygic Trip Planner has 500K users. It has an intuitive user-interface and brilliant features. 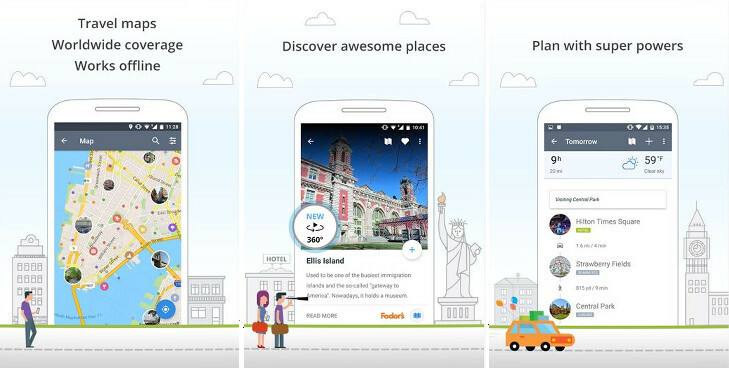 The app prompts users to enter the name of the place they want to travel. Once the user enters the destination, Sygic recommends the top places, hotels, restaurants, gas stations, hospitals, ATMs, etc. The app allows you to find a place by its name. If the place is a popular tourist attraction, you can read its details on Wikipedia. Sygic allows you to book tours and hotels. Before booking a room, you can check its daily tariff. You can also read the review of the hotel with the Sygic application. The app lets users filter hotels by their name, rating, price, rooms, etc. Sygic is a great application. You can use its trip planner feaure for 7 days. If you want to plan trips far in advance, you must buy the app. 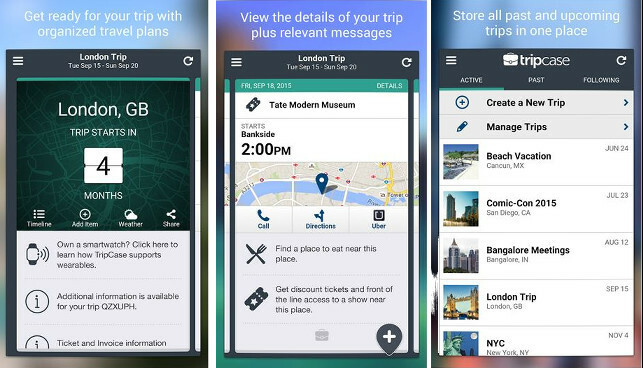 Sygic, Google Trips, Tripit, TripAdvisor, and TripCase are the best travel planning apps for Android and IOS.